Rated: R for strong language, strong violence (bloody images and disturbing content). “From Qui-Gon Jinn (Star Wars) to Ra’s Al Ghul (Batman Begins) to Brian Mills (Taken) to Zeus (Wrath of the Titans) to Ottway (The Grey), Liam Neeson is a BAD man! After surviving a horrendous plane crash, Neeson and 6 others in this chilly thriller must work together and persevere in the harshest of conditions in order to stay alive. Aside from the elements, hunger, disorientation, and paranoia, the men must also contend with a pack of ravenous wolves that are intent on taking them down one by one. The Grey is full of suspense, thrill, excitement, and fear. It has several of the -what I call- “Shock and Scare” moments! (I could not help but laugh quietly to myself every time the 3 women sitting next to me in the theaters would jump and let out a slight shriek whenever they got scared!) Without a doubt, The Grey brings with it several levels of excitement and adventure. 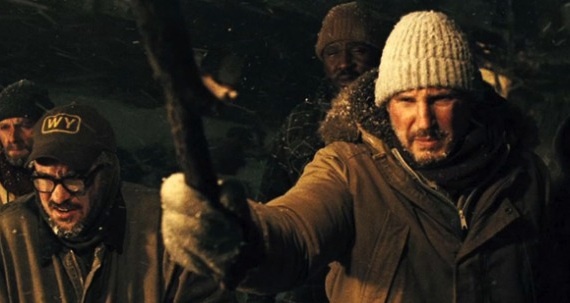 Liam Neeson portrays the gritty outdoorsman with a good sense for survival quite well. A gritty exterior but yet allows us to see the man underneath from time to time which allows for better relation to his character. His character, however, remained the only character that really was of any meaning. Immediately after the first wolf claims his first victim it is understood exactly what the rest of the characters are there for. 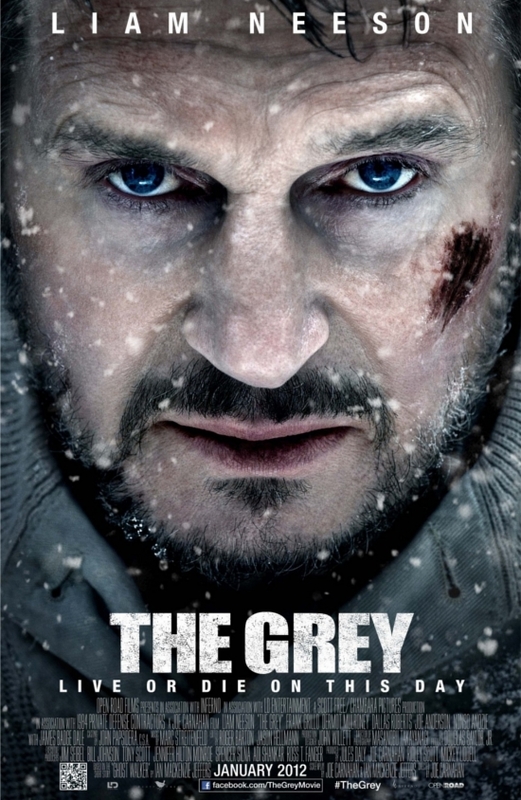 With some mediocre attempts to create quick meaning to each of the characters before their “exit,” The Grey lacks in keeping you interested in any of the other men short of Neeson. So, when it is time for the next victim it is more of a guessing game as to who it will be and who will survive. …and that’s okay, I suppose. Plenty of suspense with the wolves and the harsh environment makes up for that. However, it is the built up anticipation of the wolves that left me with probably the biggest disappointment of all. This film promised so much more in teases with the trailer, the poster, the promo material, etc…and does not keep up its end of the bargain. I could deal with the lack of character development. I could deal with the stereotypical self-sacrificing suicides and expected exits of characters that we see in survival movies (Vertical Limit, Day After Tomorrow, etc). I could even deal with the disbelief that none of these men except Neeson ever watch episodes of ‘Man vs. Wild’! But what disappointed me most is what I went to see the movie for most of all never happened! The Grey– not bad. Not great. Great cinematic work and fantastic suspense accompanies this chilly adventure that packs a ton of grit and fear. It promised to be full of so much more, but in the end, left me feeling quite gray. Next Movie News Monday for January 30, 2012! We ended up i the same place with this one. I gave it 3.75 and you gave it a 3 out of five. Love that line you wrote about understanding the reason for the other survivors being there. Hi Mike! thanks for visiting and commenting today. I will be by to check out your review here soon. Thanks for your kind words! I can’t wait for your Descendants review my friend! I know, right? 2?! This one barely makes it for me though. JUST over the halfway mark. The Descendants review should be published here shortly! Thanks. How was your weekend? 3/5 sounds OK to me!! I might have to give this a go later in the week. thanks for reading, Scott. Did you see anything good this past weekend? Awww. Disappointed you didn’t like it more. Thought that it was a really really great movie. I’ll forgive the lack of action for the fact that they focus on the deeper conversations that people would have when facing death. I’m with you with “the cut away”, but I can support it artistically. You know all that you need to know, you know that he’s going to fight. Thought it was great, but I can see the points you make. Fogs! haha, well, it appears this is the “MONTH” that we don’t see too much eye to eye. lol. I need to see your review. I will be over soon to check it out. Hope you’re doing great. Thanks for taking the time to read and comment! Does he fight wolves? That’s all I need to know to see this movie eventually. I heard the movie was extremely short though. Something like 70 something minutes? I’ll probably catch this on streaming eventually. Thanks, T.
to answer your question…in a manner of speaking. I won’t spoil it, but catching it on streaming is probably a better idea. “I could even deal with the disbelief that none of these men except Neeson ever watch episodes of ‘Man vs. Wild’!” LOVE it, so snarky yet so spot on. This movie isn’t something I’ll watch on the big screen, I mean it looks cold and snowy just like in my neck of the woods, PLUS there are flesh eating wolves, so not exactly what I’d call entertainment, ha..ha..
thanks Ruth. A great honor to be featured, and with Fogs’ no less! Can’t wait to check out the feature. I couldn’t wait to see what u thought. And it seems that we are in line on this one my friend. Great review as always. thank you for reading and for your kind compliment. I was disappointed. Ur headed to NY next wk right? Or am I late? haha. yeah, not certain yet about the veracity of the rumored music! haha. I will be on vacay starting this wknd. u remembered correctly. ooh, I will be most interested in your thoughts if you do choose this one. Please be sure to send me a link for your review if you do! I’m torn on whether or not to see this one- I could really use some Neeson-on-wolf action, but from what you’re saying if I go into this one expecting that I’ll be sorely disappointed. Maybe I’ll just catch it at the two dollar second-run theater. The 2-dollar theater is perhaps the best option for you then. If that is what u r looking for. With all the positive to good reviews I’ve been reading I think I need to give this film a go. Sounds like decent cinema fodder for this time of year. I can’t say no to Neeson taking on some wolves. With a bunch of broken mini alcohol bottles. But last I checked…mini bottles were plastic…not glass. Ha! I’ll b interested in your thoughts.